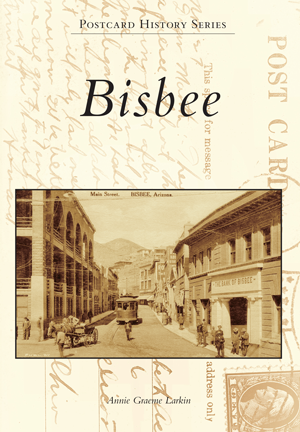 Visually, the Bisbee of today remains a community frozen in time, with Main Street retaining its character from 1910. The discovery of copper deposits in the Mule Mountains brought forth a wealth that enabled a substantial community. Profitable mining ventures and a need for labor drew thousands of miners from around the world to work in Bisbee. These individuals added a distinct flavor to the area. Like countless other Western mining camps, Bisbee evolved from a rough frontier community surviving disastrous fires and floods into a town with a substantial population and solid foundation. Bisbee's seemingly inexhaustible mineral wealth resulted in the community becoming a center of economic and political power in an emerging territory on its way to statehood. It was Arizona's greatest copper camp. From a Bisbee pioneer family, Annie Graeme Larkin has been steeped in the community's history her entire life. It was her fascination with the community's past that drew her to collecting local postcards and preserving the region's history. With a history degree from the University of Arizona, she is the curator at the Bisbee Mining & Historical Museum.